Peter Cushing stars in this clever but rather dialogue heavy early horror from Hammer Films, directed by Val Guest. DD-Video R0 DVD. Hammer made their first, highly sucessful excursions into horror, with an adaptation of Nigel Kneale's popular Quatermass television serial as The Quatermass Xperiment (1955). They quickly followed this up with the equally sucessful X the Unknown (1956) and the next year saw their most sucessful production to date - the dramatic gothic horror Curse of Frankenstein (1957) starring Peter Cushing. Before the film had even been released, Hammer looked for a chance to use their new big name in another film - and secured the rights to another Nigel Kneale BBC teleplay - The Creature. While Nigel Kneale's television scripts of the Quatermass serials had proven a solid basis for director Val Guest to rewrite for the big screen, for The Abominable Snowman, Hammer chose to bring in Kneale himself to write the screenplay. The story is surprisingly clever and covers a lot more ground that one might expect for what appears at first to be nothing more than a typical monster B-movie. From the beginning, there is a strong character line drawn between the quiet and respectful Dr. Rollason with his academic friend and nervous wife, and the exaggerated John Wayne style bravado of Dr. Friend. As the group progress into the mountains, the film becomes stranger with one of the crew seemingly becoming possessed and we are left unsure of the motives of the Buddhist group who seem to be trying to stop them. As the film nears its conclusion we get a variety of political and moral themes concerning the danger of mankind's pushes deeper into exploration and scientific knowledge - a theme similar to Kneale's Quatermass scripts. The climax is well written, unexpected and actually scary. Ultimately though, Kneale's script is rather too clever for its own good, and it is clear that he is unfamiliar with the different requirements of a teleplay and screenplay. In the 1950s television was grainy, black and white, and watched on tiny screens - so television scripts mostly focused around dialogue and were often closer to radio plays - as a result, Kneale's script is dialogue heavy and it often seems that the characters are rushing their lines to keep scenes to a reasonable length. The subplot concerning Rollason's wife takes a lot of screentime away from the main story and could easily have been removed without affecting the main storyline. Director Val Guest is limited by the dialogue heavy script and a necessity to keep the run time to the 90 minutes needed for a double-bill presentation. Many of the best and most effectively eerie shots in the film, are the long shots (boosted by the scope widescreen format) of the climbers accompanied by the effective orchestral soundtrack - unfortunately, these shots are all too brief, as are the wonderfully haunting shots of the mountains as the creatures cry to each other in the dark. Guest uses the black and white 'newsreel' style photography of his Quatermass films to keep the film 'down to earth', a long way from the fantasy feel of the Terence Fisher gothic horrors, and his strong use of camera angles to keep the creatures off screen most of the time helps to keep the movie away from its potential B-movie roots. The studio bound mountain sets are impressive and although never completely convincing, they blend well with the location shoots, themselves well filmed in the French Pyrenees. Peter Cushing takes the lead role here. He had actually played the same role in the television serial when it played on the BBC and suits the mild mannered Rollason perfectly. As was still Hammer's style at the time, an American actor was cast in the co-lead role to help it sell overseas: Forest Tucker gives a good perfomances as the boisterous Dr. Friend. 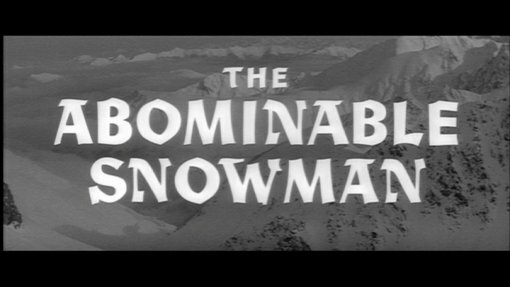 Often overshadowed by the subsequent gothic horror films, The Abominable Snowman, despite its typical monster movie theme, has one of the cleverest plots of the 1950s Hammer Horrors and some very strong visuals - but it suffers under a dialogue heavy plot that makes it less enjoyable than many of its cousins. Certainly of interest to fans of Hammer and Peter Cushing, it comes partly recommended. Anyone famous in it? Peter Cushing - the star of many of the best of the Hammer Horror films including Dracula (1958). Forrest Tucker - famous for his appearances in US television show F Troop and star of many films. Directed by anyone	interesting? Val Guest - a former comedy director who shot many important Hammer films between 1954 and 1960 including their first horror picture The Quatermass Xperiment (1955). Is it scary? A couple of scenes might prove scary thanks to the effective atmosphere. Any gore or violence ? A few deaths but nothing notably violent. Who is it for? Fans of Hammer horror and Peter Cushing should enjoy this. Visuals Original Aspect Ratio - 2.35:1 anamorphic widescreen. Black and White. The print is good, with little print damage and light grain. Audio Commentary (recorded for the ABUS DVD) with Val Guest and Nigel Kneale (seemingly recorded seperately), has some interesting stories, but a little flat. World of Hammer - Peter Cushing. A 1980s TV show featuring a mix of low quality clips from a variety of Hammer films, although without context or interviews. Rather dull. (25 minutes). The DVD box also includes a detailed 24 page booklet about the film and its background. Availability Available as a single-disc release or in the Peter Cushing Collection boxset. Both include the booklet. Was also available in a dual-pack with X the Unknown. Other regions? E-M-S German R2 DVD (title Yeti der Schneemensch) and ABUS R0 DVD (now out-of-print). Both include audio commentary, neither include interview or booklet. Cuts? None known - this print is the original British cinema version. A cleverly scripted film, but rather dialogue heavy and with missed potential. Partly recommended to Hammer and Cushing fans. A good looking and sounding print, with a good set of bonus features. The best DVD release of the film. Find the DVD reviews of other films starring Peter Cushing or directed by Val Guest. Find reviews of other Hammer films. All text in this review written by Timothy Young - 1st October 2006.